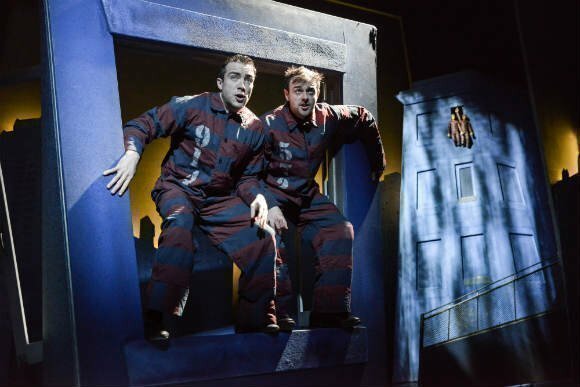 The Comedy About a Bank Robbery is written by Henry Lewis, Jonathan Sayer and Henry Shields, all members of Mischief Theatre Company. 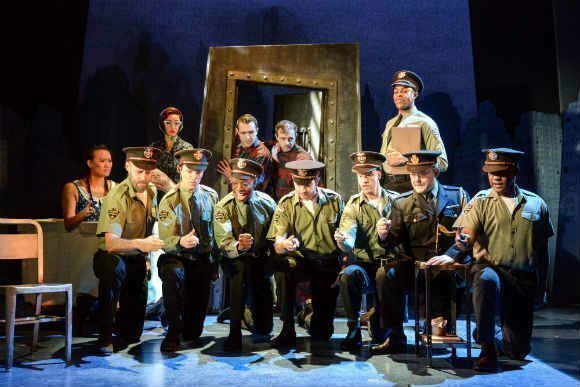 It was first performed in April 2016 and premièred at the Criterion Theatre. It's presented by Kenny Wax Ltd and Stage Presence Ltd, and it is already a sure fire comedy hit. What's the plot? It's a classic recipe. Take one massive diamond. Stir in eight totally incompetent thieves. Add a hopeless security guard, who's fast asleep on the job. What could possibly go wrong? What could possibly go right is a much better question, as everything that could go belly up does exactly that to splendidly funny effect. The Times calls it "A Fast and fabulous comedy caper is a joyful night out". Time Out says it's "The best new comedy to open straight onto the West End in decades" The Guardian calls it "Thrillingly inventive and lung-bustingly funny". 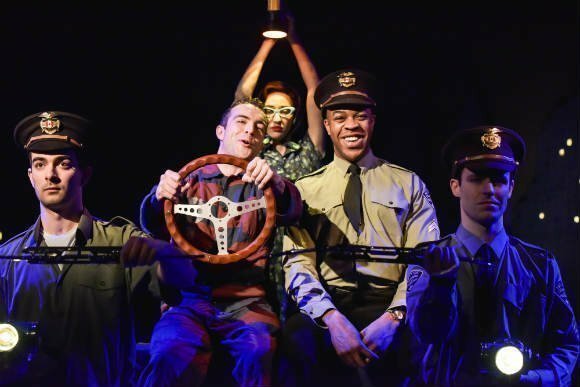 Whatsonstage says it's "A night of spectacular madness" and the FT reveals the show has people “Laughing all the way to the bank"
Mitch Ruscitti is played by Henry Shields and Mr. Robin Freeboys by Henry Lewis. Jonathan Sayer plays Warren Slax and Nancy Zamit plays Ruth Monaghan. Sam Monaghan is portrayed by Dave Hearn and Caprice Freeboys by Charlie Russell. Cooper is played by Greg Tannahill, Randall by Jeremy Lloyd and Chris Leask plays 'everyone else' in one of the funniest shows to hit town for ages. Don't miss it! 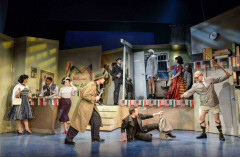 The Comedy About A Bank Robbery is suitable for people aged 11 and above. 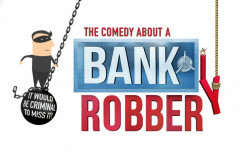 We have a great selection of cheap The Comedy About A Bank Robbery tickets. 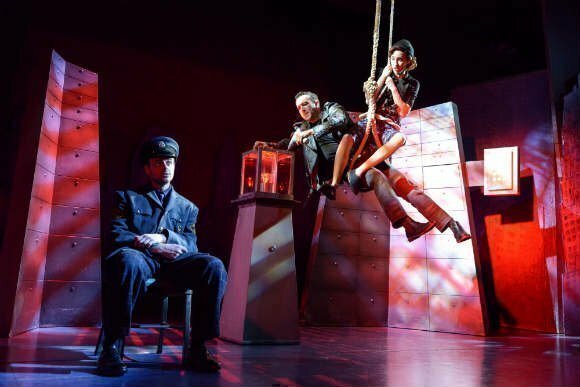 We can help you save up to 70% on The Comedy About A Bank Robbery tickets! 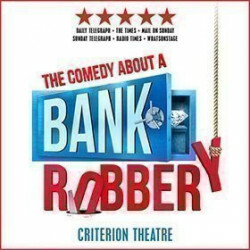 If you're looking for discount theatre tickets have a look below for our latest offers for The Comedy About A Bank Robbery at the Criterion Theatre. Having seen “The Play that goes wrong” couldn’t wait to see this play. It didn’t disappoint it’s so well written, extremely funny and one that should not be missed. Can not wait for the next one by this company. It would be a crime to miss this diamond of a show! Very colourful, mind bogglingly funny. Almost laughed my guts out. Laugh a minute..........fantastically talented Actors......Brilliant !!!!!! Absolutely brilliant,funny from beginning to end. Nowhere near as good as there previous show, "The Play That Goes Wrong". Show had short bursts of excellence but not enough to carry the whole show. This is a hugely enjoyable show for many reasons. It is energetically funny with no low or boring parts. Keeps you entertained with strong performances by all the cast. If you have a sense of humour then this show is a must. Hilarious comedy with wonderful word plays. Great for a fun evening out! Very funny, good entertainment, loved it with my daughter. It is definitely an advantage if you understand English quite well, otherwise a lot of the puns won‘t land but nevertheless it was very funny and entertaining! Took a chance and looked quickly at the reviews, I didn't even read the story or looked into it as I wanted it to be a surprise...well a surprise it was...what a show, the actors all well acted and the decor and background walls were just superb...highly recommended to see. Fun word plays and silly jokes wear down the urge not to laugh till laughing is unavoidable. This was an excellent show, truly a laugh a minute , the cast put in a huge physical effort for a show that included songs, physical gags double takes and comedy at a frantic pace, highly enjoyable. A great night out ! Pure entertainment, wonderful in their timing of some old school light-hearted comedy. A refreshing and passionate cast. Fantastic theatre, Criterion warm and very welcoming space creating a great environment for all to enjoy. Funniest thing out there, we laughed from start to finish, the funnys just kept on coming. Small theatre so excellent view of the stage from where ever you are seated we was in the stalls and had a great view. Comfortable and very clean. 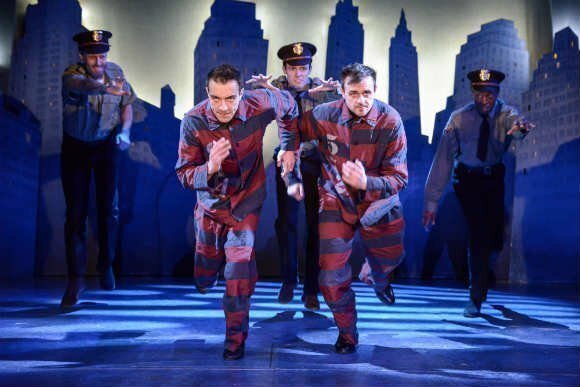 Struggled to choose between 3 West End plays & made the right decision with The Comedy About a Bank Robbery. Had a bit guess 'who dun it' & was wrong!!!! A wonderful time, unexpectedly extremely funny and impressed by great acting. Would recommend to all. Not quite as good as the play that goes wrong but still very funny. Actors were excellent and talented. Very small theatre with some seating with restricted viewing. Funny and well presented. american twist on English style farce. Busy action with lots of cleaver word play and farce type action. Plus music an song mixed in. Great show, loved the humour and would definitely recommend to other. Wasn't sure what to expect as I'm not a regular theatre goer, but it was hilarious and the cast were great. It was right up our street! Very funny slapstick style comedy with great actors. The show was really funny, good story and the jokes were on point. It was housefull and the audience was amazing, would recommend watching it for sure. A must see, very funny! It was funny, engaging. Wouldn't recommend to anyone who doesn't speak fluent English as there was a lot of word play, so if you don't understand the word play then you kind of miss half of the show. it’s genius! a must see! The show is simply amazing, the plot is nice but the actors, the music, the scenes are absolutely amazing and genius at some points. I’d like to see it again straight away! Incredibly clever and funny show. Highly recommend this show. Same theatre group as The Play That Goes Wrong which we thought was funnier, but this show was still funny, extremely well acted and scripted. A great weekend treat for the whole family at affordable prices. We attended with little knowledge, we usually see musicals and tagged this show onto a weekend of theatre OMG what a fab show... the timing was perfect the laughs genuine and heartfelt, the cast just perfect so so clever we loved it cannot express enough the fun it actually made the weekend. choreograph, stage, acting, music all good!! And fun!!! Incredible, funny, surprising, perfect acting. One of the best in my life! A great show with a brilliant cast with great comedy timing. Plus some amazing singing voices! We have a great view and sound from our seats, row E in the stalls. Funny, definitely a good watch! A very well put together comedy. A slow start but by the second act it was really funny. Some good 'stage tricks'. Excellent scenery. A simple plot but brilliantly executed. ... not their best. This is a fairly standard British comedy along the lines of a conventional bedroom farce. The second act is far stronger than the first with greater demands placed on the cast along with far more inventive set design. Having been impressed by their previous work, 'The Play That Goes Wrong,' I was expecting something at least as good here but came away disappointed; funny, yes, but not at the laugh-out-loud level of TPTGW. With humour being subjective its hard to know if its funny without actually seeing it, I take the blame for my humour, but not funny for me, good characters and okay acting, but we didn't laugh once, it was all a bit "see it coming a mile off" humour. Great building and helpful polite staff though. Was a great play, had story line, bags of wit and humour to the emotional and the sadness to one hell of a twist! I would recommend it to anyone! Excellent show. Laughing from start to finish. Good value. More than a laugh a minute. If you like a good laugh, that's the show. Playing with the language is thing alike very much. "Forces" you to go along, to participay, to figure thins out. If you want to forget about real world for a couple of hours and enjoy slapstick comedy, this show is for you. Great acting with a twist is an ending. I cried I laughed so hard! Great choreography of sets and slapstick humour. Enthusiastic actors who looked like they were enjoying themselves. A fun night at the theatre. Hilarious slap stick comedy, must see! The second time I’ve seen this show. Laughed more the second time. The actors comedic timing is excellent. The cast look like they are having as much fun as the audience. Thank you for a great night of comedy. If you like slapstick. Go. Fast, furious, slapstick with a few songs. Stage play very inventive and gripping.Very funny the whole audience was in uproar! 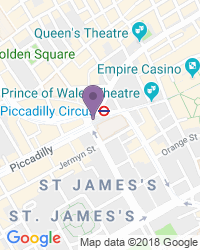 Mischief Theatre, a group of acting graduates who took London’s West End by storm with THE PLAY THAT GOES WRONG and PETER PAN GOES WRONG are at it again! 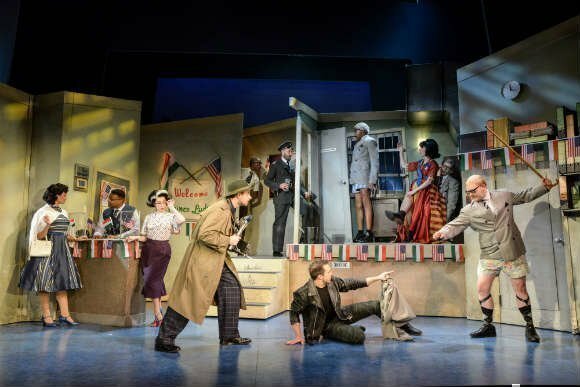 But whilst their two previous productions offered something new and exhilarating their newest THE COMEDY ABOUT A BANK ROBBERY seems at times too obvious and its slapstick style might suit only those who are after some light entertainment. Use the search box at the top left of this page to search for The Comedy About A Bank Robbery tickets availability.